A true classic French soup, this is packed with onion flavour and is delicious for those occasions when soul food is needed to raise the spirits. Serve our French Onion soup with some bread and a salad and it makes a meal all of it's own! 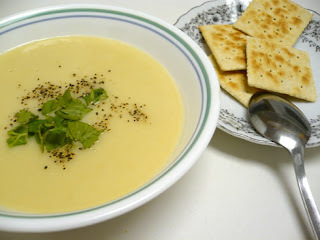 The recipe also describes how to make the easy cheese topped bead, essential for a soup like this. This is a great way of making use of the onions from your garden. You'll already have most of the other ingredients in your kitchen cupboard so no need to buy lots of ingredients. Don't be fooled by the fact that this is a French Onion Soup recipe! It's almost a main meal when combined with the bread a cheese. 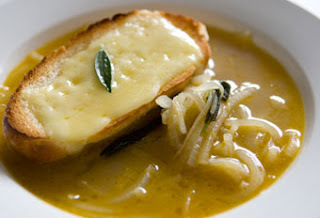 The ingredients in the French Onion soup recipe below will make enough for four good portions. As far as the French Bread is concerned, you can substitute it with normal white or brown bread that has been toasted. We used garlic bread which went down just lovely! The exact proportions of some ingredients are a matter of taste. Some people really like the flavour of Worcestershire sauce and I know my son would double or even triple the amount I use. Have a taste of the soup when it's nearly cooked and add a bit more of what excites your taste buds. 2 tablespoons of margarine or butter. Beef broth (easiest to add 3 stock beef cubes to boiling water). Vegetarians use vegetable broth / stock. White wine (sherry will also do). Gruyere or mozzarella cheese to top the bread. Most cheeses will do as well. Just one note - chopping up 4 onions is a very 'crying' experience! I've no magic recipe to stop the tears, but the result is well worth it. Apparently chewing gum whilst chopping the onions does make some difference but I'm not guaranteeing it! Start by peeling the four onions and chopping it into small bits. This is the most laborious part of this recipe - it takes 10 minutes or so to chop up four onions and the tears will flow! Put the onions into a frying pan, add the butter, margarine or olive oil and turn up to a medium heat. Turn the onions every minute or so to ensure they are evenly cooked. Aim to cook the onions until they are a medium brown colour. Transfer the onions from the frying pan to a large pan and add all the ingredients except the cheese and bread. Cook the soup on a medium heat for about 30 minutes. The aim is to get the onions so they are soft but not falling apart. While the soup is cooking, put the soup bowls in the oven to get them warm. Cut up the French bread into slices and put them under the grill to very lightly toast them (a bit less toasted than shown in the picture!). When lightly toasted, spread some cheese over each slice of bread. Just before the soup is ready to be served, put the cheese topped bread under the grill and cook until the cheese starts to bubble. The bread is then meant to be put on the top of the soup and served. However, we weren't too keen on this so in the picture below the bread is served on a separate plate. This looks like a snack-sized meal but in fact it's quite filling. With enough toast and a crisp green side salad, it's a meal all on its own. French onion soup is a perennial favorite that anyone can make at home. A simple soup, it gets its flavor from browning the onions very slowly. 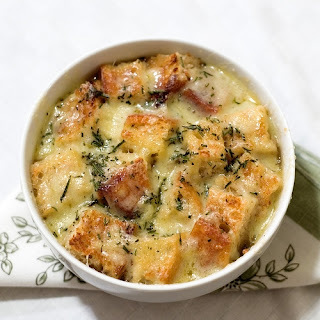 And everyone loves the topping of a hearty crouton with melted cheese. This recipe serves about four. Cut the onions in either a 1/2-inch dice or long strips about 1/4-inch wide. Most French onion soup recipes call for the strips, but diced onions can be easier to eat. Heat a large saucepan on medium-high heat and add the oil. When hot, add the onions and butter, stir together and cook. When the onions are a deep golden-brown, add the flour and stir together. Cook 1 minute. Stir in the chicken stock and marjoram, raise heat to high, and bring to a boil. Season generously with pepper and lightly with salt, and reserve. While soup simmers, cut four thin slices from the loaf of bread, brush lightly with butter, and toast at low heat until dry. Heat the broiler and ladle the soup into ovenproof serving dishes. Lay a slice of toasted bread on top of each dish of soup, top generously with cheese, and place under the broiler to melt the cheese. Remove when the cheese is bubbly and browned in spots. The trick to a great French onion soup is starting with good stock. 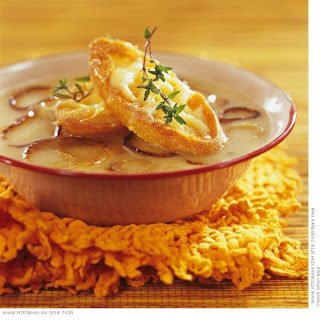 French onion soup is usually made with beef stock. I've made delicious soup with stock from the leftover rib and chine bones of a rib roast. Another important element is the proper caramelization of the onions. Caramelizing onions take at least thirty minutes of slow cooking the onions over medium high heat. The browning, or caramelizing, of the onions brings out the sweetness in them. Add garlic and sauté for 1 minute. Add the stock, vermouth or wine, bay leaf, and thyme. Cover partially and simmer until the flavors are well blended, about 30 minutes. Season to taste with salt and pepper. Discard the bay leaf. To serve you can either use individual oven-proof soup bowls or one large casserole dish. Ladle the soup into the bowls or casserole dish. Cover with the toast and sprinkle with cheese. Put into the broiler for 10 minutes at 350 degrees F, or until the cheese bubbles and is slightly browned. Serve immediately. Preheat oven to 400°F. Rub a little olive oil over the stew meat pieces, carrots, and onions. Place stock bones, stew meat or beef scraps, carrots and onions in a large, shallow roasting pan. Roast in oven for about 45 minutes, turning the bones and meat pieces half-way through the cooking, until nicely browned. If bones begin to char at all during this cooking process, lower the heat. They should brown, not burn. When the bones and meat are nicely browned, remove them and the vegetables and place them in a large (12 to 16 quart) stock pot. Place the roasting pan on the stove-top on low heat (will cover 2 burners), pour 1/2 cup to a cup of hot water over the pan and use a metal spatula to scrape up all of the browned bits stuck to the bottom of the pan. Pour the browned bits and water into the stock pot. Add celery tops, garlic, parsley, bay leaves, and peppercorns to the stock pot. Fill the stock pot with cold water, to 1 to 2 inches over the top of the bones. Put the heat on high and bring the pot to a low simmer and then reduce the heat to low. If you have a candy or meat thermometer, the temperature of the water should be between 180° and 200°F (boiling is 212°F). The stock should be at a bare simmer, just a bubble or two coming up here and there. (You may need to put the pot on your smallest burner on the lowest temp, or if you are using an oven-safe pot, place it in the oven at 190°F.) Cover the pot loosely and let simmer low and slow for 3-6 hours. Do not stir the stock while cooking. Stirring will mix the fats in with the stock, clouding up the stock. At the end of cooking time (when you want to end the cooking is up to you, 3 hours minimum, 6 to 8 hours if you can do it) use tongs or a slotted spoon to gently remove the bones and vegetables from the pot (discard them, though if you see a chunk of marrow, taste it, it's delicious). Line another large pot (8-quart) with a fine mesh sieve, covered with a couple layers of cheesecloth if you have it. Pour the stock through the sieve to strain it of remaining solids. Let cool to room temperature then chill in the refrigerator. 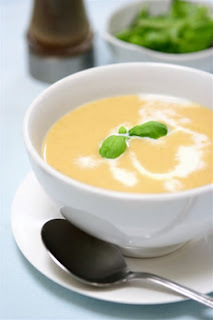 When the weather gets cold, many people want to eat soup. 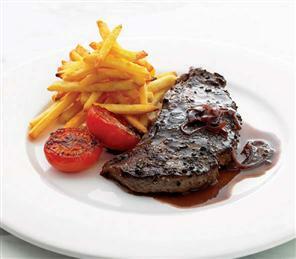 It's comforting, filling and tasty. With this french onion soup recipe, you'll wow your friends and family. Saute the onions. In a heavy skillet saute 2 1/2 cups of thinly sliced onions in 2 1/2 tablespoons of butter and 1/2 tablespoon of olive oil for 30-40 minutes or until onion is well browned and caramelized. Stir in spices. Stir in 1/2 teaspoon of each of the following: flour, salt, dry mustard and pepper. Cook mixture for 2 minutes. Pour in 2 cans of beef broth, 1 can of consume and 1/2 cup of sherry. Cook the soup over low heat stirring until it comes to a boil. Simmer for 30 minutes. Make fresh french bread croutons. Slice french bread. Butter each slice slice. Top with fresh garlic. Broil in the oven till brown. You want the bread to be crunchy but not burned. Once the bread is toasted, cut it into cubes. These cubes will serve as the croutons for your soup. Place bread in flame proof dish. Layer the bowl with the bread. You will use approximately 8 to 10 cubes. If you desire a thicker soup, add more bread. Pour soup mixture over the bread making sure to cover it completely. Top with Gruyere and parmesan cheese mixture. Grate 1/2 cup of Gruyere cheese and mix it with 1/2 cup of parmesan cheese. Place in the oven. Make sure the oven is still set on the broil setting. Broil for 3 to 4 minutes or until cheese is brown and bubbly. Watch the soup very carefully because you don't want to burn the cheese. Enjoy your soup! This easy potato soup recipe is perfect for when the weather forecaster is predicting a hefty snowstorm coming your way. You’ve heard that before but you decide not to give into the panic shopping that takes place across the region. The following morning you awake, let the dog out and after wrestling with the back door, see snow and lots of it. The day goes on, the kids are inside after blissfully sledding, having snowball fights and making snowmen. Suddenly you realize it’s nearing dinner. No worries, here’s a hearty, easy potato soup recipe that requires ingredients we all have in our pantry. Cut potatoes into small pieces and cook in salted water, with the onion. In a heavy pan melt the butter over low heat. Stir in flour and cook until bubbly. Slowly add half of the milk. Add hot, cooked potatoes and onion mixture. Use a potato masher to break up potatoes a bit. Add the rest of the milk and the salt and pepper. Cook over medium heat until hot. If it is not thick enough, shake 1 tablespoon of flour with 1/2 cup cold milk and add to the soup, stir frequently, garnish with a sprinkle of dried parsley. Soup recipes are easy! Whether you are looking to warm up, lose weight or hoping to get better soon, these recipes will do the trick. I was always the kid who refused to eat my vegetables. I have to tell you that now one of my favorite soup is actually vegetable soup. I guess I just grew into it as I got older! This is the kind of soup you can make a huge amount to freeze and have for lunch over the week. You'll need a blender though to blend up all the vegetables. Good luck and enjoy! Chop the top of the leek off (1). Slice the leek (2) and celery (3). Peel and slice the potatoes (4) and apple (5). Measure out the milk and the chicken broth and make sure you have all the ingredients (6).